Two weeks of house detention have turned me into frenetic baker. To the point that I was left without flour, eggs or butter in the end, not being able to go shopping. Forced detention, seeing that my three kids keep handing down the viruses, bacteria and every possible germ present in the air to each other. I couldn't but fall victim myself. So, now, with all the beauties that keep coming out of my oven, from bread, pizzas, focaccias to sweet pastries, I haven't been able to feel tiniest scent. As for that, I don't feel the bad smells either, which isn't always as good as it may seem. My son knows something about it, as the poor thing goes around after having filled his diaper for hours without me noticing anything wrong. Escaping to the kitchen, kneading and baking I've been trying to avoid becoming insane. I think my husband thinks the same I'm insane, as every evening he comes home from work to find the kitchen full of bread, sweet pastries or other stuff. You would expect someone in my situation to rest and take a nap in the afternoon once the children are having one. But no! I feel like if I sit down, I won't be able to get up any more. 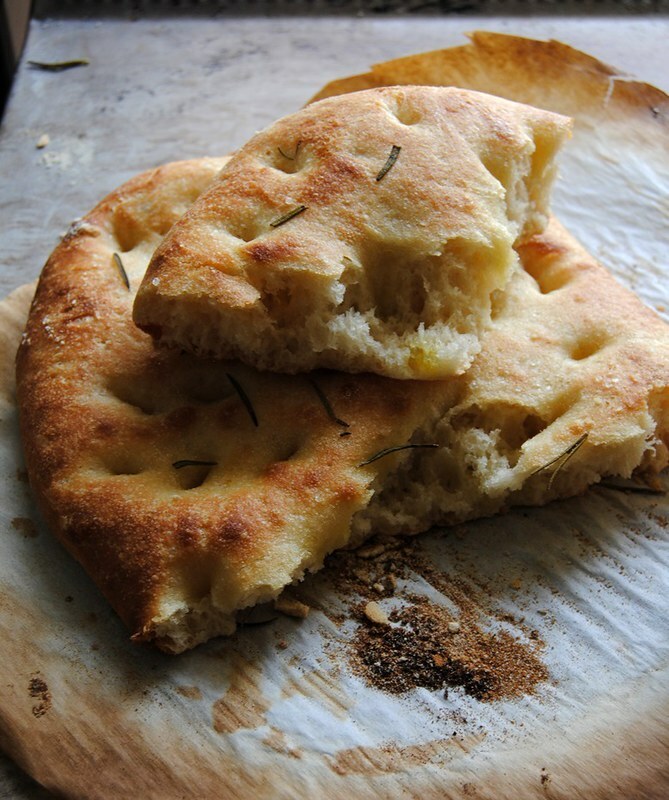 I've been wanting to share this recipe for focaccia & pizza dough for weeks now, even longer. I've tried many, with more or less success, more or less complicated, with yeast or sourdough starter. But this dough has become our favourite one over the past few months. It's made with tiniest quantity of yeast which calls for long resting times, and results in soft and light dough once it's baked. Whether I make pizza or focaccia it's become my only choice. Sometimes I leave a piece of the dough in the fridge so I can have a nice, warm focaccia for lunch or dinner the following day. Sometimes I make a double quantity of the dough. And sometimes I bake it for days in a row. Friends that had this focaccia at my house, can't wait to be invited over again. The focaccia disappears the moment I take it to the table. 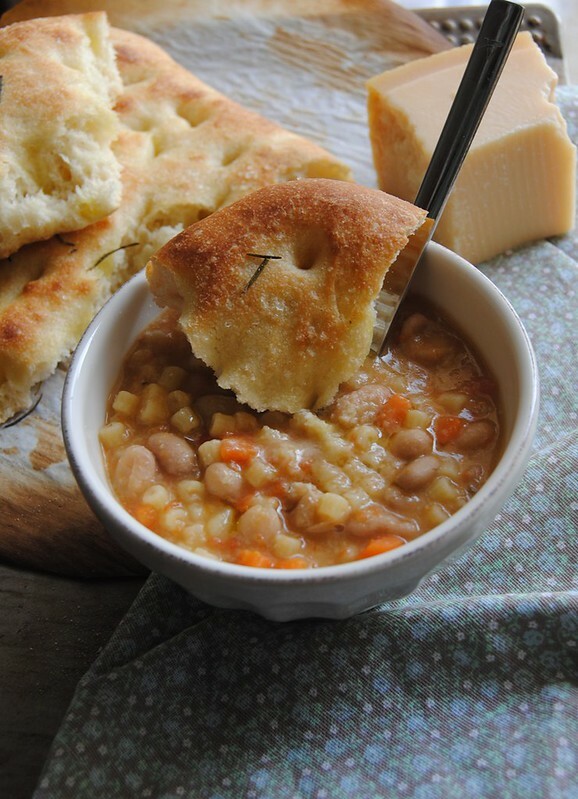 I could serve this focaccia only for dinner and everyone would be satisfied the same. But try adding some prosciutto, or salami, mortadella or cheese along, the only sound you'll hear will be mmmmmmmmmmmmmm!!! To get the best result, however, don't rush the dough. It needs long period of proofing to reach the best result once it's baked. Also the steam during the initial baking phase is important - it helps the dough spread/rise better, and the crust will be thin and crispy, not hard as a biscuit, while the interior will be airy and cotton soft. I create the steam by throwing a handful of ice cubes into the oven (steam is created instantly and last just the time necessary to bake the focaccia or pizza), you could also place a shallow pan with hot water during the first 10 minutes and then remove it and bake the focacca until done. Pour all the water into a mixing bowl. Dissolve the yeast and the sugar in it. Add half of the flour and mix with a wooden spoon. Stir in the oil, and then the rest of the flour and the salt. Knead the dough on the kneading board dusting with a little flour just so it doesn't stick too much. However, it will be very soft and a little sticky. Don't worry if the dough at this point isn't nice and smooth. Form a ball, place it on a floured kneading board and cover with a large upturned bowl. Let the dough rest for 15 minutes and then knead it again for 10 seconds. Repeat three more times, letting the rest each time for 15 minutes (if I'm busy and forget about it, my dough sometimes rests for half an hour or more). After the last rest, divide the dough in two parts (or more if you prefer making small focaccias). Form two balls and place each in a separate, lightly oiled container with a lid. Let the dough proof at room temperature for 3-4 hours. If, instead, you intend baking it much later or even the following day, put the dough in the fridge (making sure you take it out in time - about 2 hours to reach room temperature and about 2-3 hours for final proofing). Take one part of the dough and place it on a generously floured piece of baking paper (I use semolina flour for this purpose). Flatten the dough gently - pressing with your hands, but without using a rolling pin or pulling and streching the dough, to approximately 1,5 to 2 cm thick. Pour 2 TBspoons of good extra virgin olive oil and 1 TB spoon lukewarm water in the center of the flattened dough. Mix them with the palm of your hand and spread all over the dough. 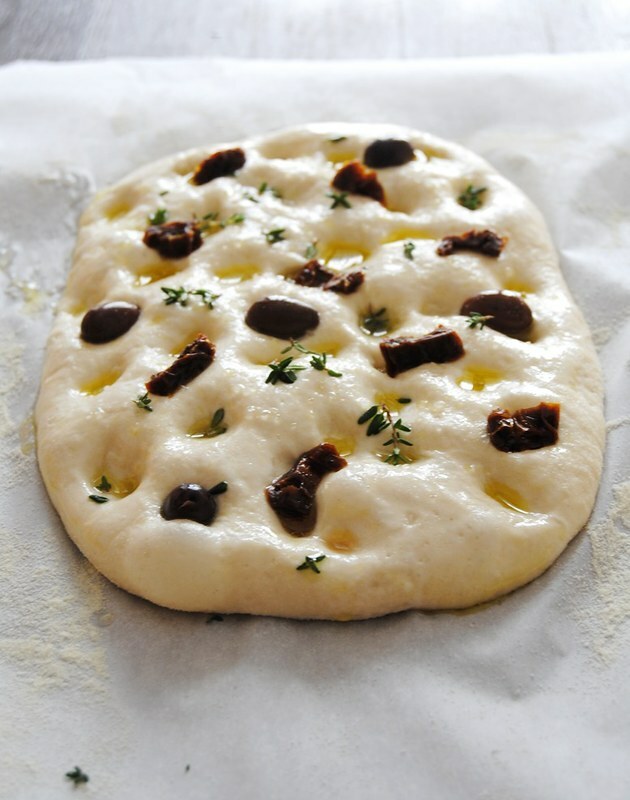 Then push your fingertips energetically into the dough to create those tipical focaccia dimples. Sprinkle the surface with whatever you like - freshly ground sea salt, fresh or dry herbs, sundried tomatoes, olives, sliced onion, cherry tomatoes etc. Cover with a piece of oiled plastic foil and a cotton cloth, and forget about it for at least 2 hours. You may decide to bake it after one hour, but if you don't hurry it, you'll be happier, trust me. Preheat the oven to 250°C and put the baking stone inside or an empty baking tray if you don't have a stone. When the oven is real hot, slide the focaccia on the baking stone/baking tray and throw a handful of ice cubes on the bottom of the oven. Close the oven door quickly, so you don't lose the steam, and bake the focaccia until it's golden brown on top. When it's done, take it out of the oven and place on the cooling rack to cool. 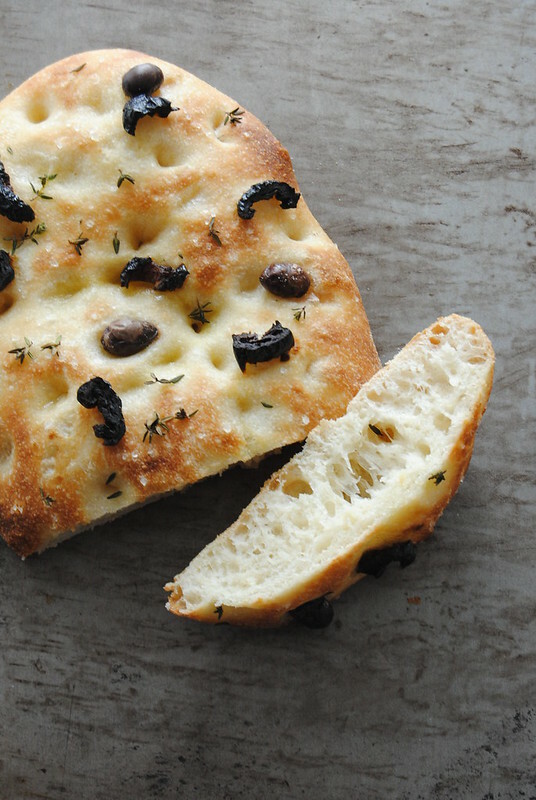 This focaccia is best served still a little warm or just cooled. Faccio spesso la pizza in casa, a volte anche due volte alla settimana. Lo stesso vale anche per il pane. Ma da quando uso il lievito madre per panificare, i ritmi quotidiani frenetici non mi permettono sempre di impastare in tempo, tra rinfreschi del lievito e impasto, insomma, ci vuole tanto tempo e pazienza. Nello stesso tempo, da quando uso il LM, impasti fatti con il lievito di birra non mi piacciono tanto. Ma ecco che arriva questa ricetta. Inizialmente la usavo per la pizza. La quantità di lievito è così piccola che neanche si sente, e richiede una lievitazione lunga e lenta, anche in frigo, volendo. Tutto ciò, fa sì che la pasta risulti leggera e saporita, nonostante sia fatta con il lievito e non LM. Può sembrare complicato, ma in realtà la preparazione è semplice: una volta preparato l'impasto e lavorato 4 volte a distanza di 15 minuti (quindi un'oretta in tutto) pasta può essere lasciata per ore a temperatura ambiente o anche in frigo per rimandare ulteriormente la cottura, oppure volendo cuocere una parte subito e conservare il resto per il giorno dopo. Quando la uso per fare la pizza la lascio lievitare per 5-7 ore. Per la focaccia invece divido i tempi di lievitazione in due parti, prima e dopo averla stesa. Versate l'acqua nella ciotola, aggiungete il lievito e lo zucchero e fateli sciogliere. Unite metà farina e mescolate con un cucchiaio di legno. Aggiungete l'olio, e successivamente il resto della farina e il sale. Lavorate l'impasto sulla spianatoia aggiungendo se necessario poca farina alla volta. L'impasto deve comunque risultare morbido, anche un po' appiccicoso. Formate una palla, mettetela sulla spianatoia infarinata e coprite con la ciotola a campana. Dopo 15 minuti, riprendete la pasta e lavoratela di nuovo per una decina di secondi. Ripetete altre 3 volte, lasciando sempre riposare la pasta 15 minuti. Dividete poi la pasta in due parti uguali, formate due palle e lasciatele lievitare in contenitori con coperchio, per 3-4 ore. Se volete rimandare la cottura (anche per il giorno successivo) mettete la pasta a lievitare in frigo. Riprendete la pasta lievitata e stendetela su un pezzo di carta da forno ben infarinato con la semola rimacinata. Stendetela con delicatezza a uno spessore di 1,5-2 cm. Versate al centro della pasta stesa un paio di cucchiai di olio extra vergine e un cucchiaio d'acqua, mescolateli e stendete con la mano su tutta la superficie. Imprimete le dita energicamente nella pasta creando dei buchi. Cospargete la focaccia con il sale grosso macinato al momento e foglie di rosmarino, timo o quello che più vi piace. Coprite la focaccia con un foglio di pellicola unta d'olio perché non si attacchi alla pasta e lasciatela lievitare altre due ore.
Riscaldate poi il forno a 250°C. Scaldate insieme al forno anche la pietra refrattaria o se non l'avete una teglia vuota. 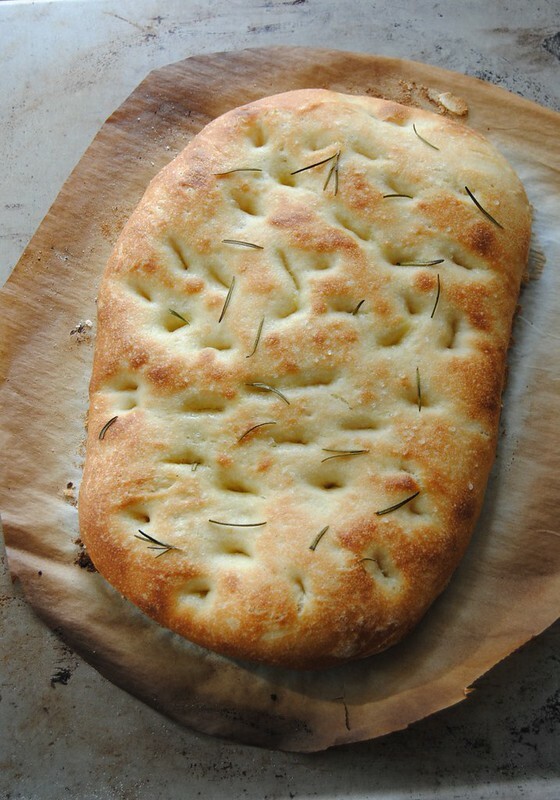 Quando il forno è ben caldo trasferite la focaccia sulla pietra/teglia aiutandovi con la carta da forno. Buttate subito sul fondo del forno 4-5 cubetti di ghiaccio e chiudete il forno velocemente per non perdere il vapore. Il vapore farà a modo che la pasta cresca meglio in cottura e la formazione di una crosticina sottile e croccante lasciando l'interno morbidissimo. Sfornate la focaccia quando avrà un colore bruno dorato e lasciatela raffreddare un po' sulla gratella. Isprobala sam dosad nebrojene recepte za focacciu. Nekima sam bila oduševljena, nekima manje. Neke su bile odlične ali prilično zahtjevne pripreme koja bi oduzimala skoro cijeli dan. Pripremala sam ih s kvascem, ali i s prirodnim kvasom/starterom. Od kad sam isprobala ovo tijesto koje je zapravo bilo tijesto za pizzu, nisam ga više mijenjala (ok, osim jednog detaljčića - u početku sam stavljala 1 žličicu jajeta, ali me je to nakon nekog vremena zamrzilo i izbacila sam ga, ništa se nije značajno promijenilo). Može se činiti da je i ovo zahtjevno, nakon što pročitate recept, ali vjerujte mi nije. Nakon početne faze pripreme kad se tijesto četiri puta premijesi u razmaku od 15 minuta, možete ga ostaviti bez problema da se diže satima (jer ima tako malu količinu kvasca u sebi, da što se duže diže to je bolje), ili čak staviti u hladnjak i odgoditi tako pečenje. Dogodi mi se često da zamijesim tijesto ujutro i ostavim do navečer. Ili ispečem jednu focacciu za ručak, a drugu za večeru ili čak sutradan. Zgodno je imati ga u hladnjaku kao rezervu kad vam treba kruha. Ostavite li tijesto da se dovoljno dugo diže, dobit ćete tako mekano i prozračno tijesto, da ćete zaboraviti uz što ste je htjeli poslužiti, najest ćete se samo focaccie. Prijatelji kad mi dolaze na večeru, sanjaju danima unaprijed da im je pripremim, toliko su svi oduševljeni. Ako se još na kraju pitate zašto ubacujem led na dno pećnice, evo objašnjenja. Naime dodate li vodenu paru u početnoj fazi pečenja focaccie ili kruha općenito, tijesto će se bolje širiti, tj. narasti. Korica koja će stvoriti bit će tanka i hrskava, a ne tvrda poput keksa. Netko stavlja na dno posudu s vodom, ja sam došla do zaključka da mi je ova fora s ledom najjednostavnija i najbolja. I za kraj, ovo isto tijesto koristim i za pizzu, samo ga podijelim na 3-4 dijela. Stavite vodu u zdjelu za miješenje, dodajte kvasac i šećer pa izmiješajte rukom da se istope. Dodajte polovicu brašna i izmiješajte drvenom žlicom. Umiješajte ulje, a zatim dodajte ostatak brašna i sol. Zamijesite tijesto prvo u zdjeli, a zatim prebacite na pobrašnjenu dasku, i kratko mijesite dodajući po potrebi malo brašno. Tijesto treba ostati dosta mekano i pomalo ljepljivo. Neće čak biti ni sasvim glatko. Ostavite tijesto na pobrašnjenoj dasci, pokopite ga naopako okrenutom zdjelom. Nakon 15 minuta tijesto premijesite, vrlo kratko, 10-ak sekundi. Primijetit ćete kako je tijesto postalo glatko i podatno. Ponovite to još 3 puta, uvijek u razmaku od 15 minuta. Nakon toga tijesto podijelite na dva jednaka dijela, svaki oblikujte u kuglu i stavite u pojedinačne spremnike s poklopcem. Ostavite tijesto da se diže na sobnoj temperaturi 3-4 sata. Ili ga stavite u hladnjak, ako iz bilo kojeg razloga želite odgoditi pečenje, pa čak i do sljedećeg dana. Imajte samo na umu da ga izvadite na vrijeme iz hladnjaka (3-4 sata). Kad je tijesto nadošlo, pobrašnite veći komad papira za pečenje i na njemu vrlo lagano rastanjite tijesto na debljinu od 1,5 do 2 cm. Ne vucite tijesto niti ga valjajte valjkom, već samo lagano pritišćite dlanovima. Po površini tijesta pospite par žlica ulja i žlicu vode. Premažite cijelu površinu tijesta mješavinom ulja i vode, a zatim energično utisnite vršcima prstiju rupice po cijeloj površini. Pospite krupnom morskom soli i dodacima po želji (npr. ružmarin, timijan, masline, sušene rajčice, luk, itd.). Pokrijte focaccie komadom nauljene prozirne folije i ostavite da se opet diže barem 2 sata. Možete je peći i već nakon sat vremena, ali iz iskustva sam vidjela da što duže stoji bolje naraste u pečenju i bude mekša. Zagrijte pećnicu na 250°C. Ako imate kamen za pečenje stavite odmah i njega da se zagrijava, ako nemate kamen stavite prazan pleh. Kad je pećnica zagrijana, prebacite tijesto na kamen/pleh (budući da je već na papiru, lako ćete ga samo "skliznuti" unutra. Čim ste stavili focacciu unutra ubacite na dno pećnice 4-5 kockica leda (stvorit će se para koja će učiniti da se tijesto bolje širi i raste u pečenju, korica će biti tanka i hrskava, ali ne tvrda). Pecite focacciu dok ne dobije zlatno smeđu boju. Ostavite je da se ohladi na rešetki. Mislim da ću da je isprobam još koliko danas :) Božanstveno! Isprobano! Testo je neopisivo divno! :) Meko, lagano, prozračno i pritom ne sadrži mnogo kvasca, što je, što se mene tiče, još jedan veliki plus. Pitam se da li bi od ovog testa mogle da se prave kiflice? Ili bi se od valjanja i "gnjavljenja" prilikom motanja istisnuo vazduh, pa to više ne bi bilo to? I meni je količina kvasca veliki plus, jer tijesto ima tako lagan okus. Nisam probala kiflice praviti. Dajana, ovu prvu sliku mi dodje da stavim na desktop. Kao oblacic je. Vidi se da je testo presavrseno. Ne znam nikog ko pravi bolje hlebove od tebe. Svaki recept i svaki uradak su ti cista perfekcija. Rekla bih da je savršeno !! ne mogu je se nagledati, a isprobavanje će biti sa punom pažnjom da je prebrzo ne pojedem, jako mi se sviđa ! Hi, Welcome to my blog. I love hearing your feedback, so don't hesitate to say what you think, or ask any question, I'd be glad to help. Benvenuti! Mi fa piacere che vi siete fermati qui. Se vi va, lasciatemi un commento, una domanda, o altro, li leggerò con piacere. Hvala vam na posjeti. Volim pročitati vaše mišljenje, stoga je svaki dobronamjeran komentar dobro došao kao i pitanja i nedoumice. Trudit ću se odgovoriti svima.